Reprinted from Journal of Mammalogy, Vol. 79: No.3 (Aug. 1998) with permission from the American Society of Mammalogists. Karl F. Koopman was born in Honolulu, Hawaii, on April 1, 1920, the son and first of two children of Martha (Brown) Koopman and Karl H. Koopman (his sister Elinor was born two years later). Karl passed away at his apartment on Manhattan's upper West Side sometime between Saturday afternoon, September 20 and Monday, September 22, 1997, at the age of 77. Karl had just returned from the Seventh International Theriological Congress in Mexico and had spent Saturday morning in his office at the American Museum of Natural History. Undoubtedly, he scanned his accumulated mail and messages, organized his research for the following week, and planned his upcoming trip to Tucson, Arizona, to attend the 27th Annual North American Symposium on Bat Research. Colleagues who saw him that final morning in the museum detected nothing amiss. As a child, Karl attended public schools in the Los Angeles area but moved to Red Hook, New York for high school, his father having joined the faculty at Bard College. Karl's lifelong interest in the natural history of reptiles, birds, and mammals was first developed among the exhibits at the Los Angeles County Museum of Natural History. Karl enjoyed nearly all of his high school science classes, and entered Columbia University intending to major in Chemistry. However, courses at Columbia such as those taught by W. K. Gregory, E. H. Colbert, and G. G. Simpson entitled "Evolution of the Vertebrates" and "Mammals, Living and Fossil" changed his mind, and he graduated in 1943 with a B.A. in Zoology. He continued at Columbia as a graduate student, earning the M.A. in 1945 and the Ph.D. in 1950. Genetics was a "hot" topic at Columbia in those years, and Karl elected to pursue graduate study with Theodosius Dobzhansky, one of the early pioneers in genetic studies using fruit flies. Karl's doctoral thesis tested the hypothesis that artificial selection against the hybrids of two closely-related sister species--Drosophila pseudoobscura and D. persimilis--would strengthen incipient premating isolating mechanisms. The paper resulting from this study was his first published work (1950), appearing in an early volume of the journal Evolution. It is one of very few of Karl's publications that are not on bats, and the only one not on vertebrates. It is still widely cited today as an early experimental verification of natural selection. Although he studied fruit flies as a graduate student, Karl continued to be fascinated by the natural history of mammals, and particularly bats. He spent a great deal of time at the American Museum of Natural History, where he interacted with fellow graduate students Max Hecht, Samuel McDowell, Rodolfo Ruibal, and Ernest Williams. His first work on mammals was a collaboration with Williams on West Indian fossil monkeys, rodents, and bats in the summer of 1949. This began nearly a decade of seminal work on West Indian bats, culminating in two important papers: "Land bridges and ecology in bat distribution on islands off the northern coast of South America" in Evolution (1958) and "The zoogeographical limits of the West Indies" in the Journal of Mammalogy (1959). Karl often expressed his wonder at how the interest in bat systematics and zoogeography increased during his lifetime. Very few colleagues know or cared about bats when he began to study them. Certainly the explosion of interest in West Indies vertebrates that began in the 1960s was in part attributable to increased government funding for scientific research, but Karl's papers played an important role, inspiring at least two generations of mammalogists to examine this zoogeographically fascinating and important region. Following completion of his degree, Karl taught for one year (1949-1950) at the Middletown Collegiate Center, and for six years as Instructor in Biology at Queen's College in New York. He then became an Assistant Curator of Mammals, first at the Academy of Natural Sciences of Philadelphia for one year (1958-1959) and then at the Field Museum of Natural History in Chicago. In 1961, he returned to the Mammalogy Department of the American Museum of Natural History as Assistant Curator, reaching the rank of Associate Curator in 1966, Curator in 1978, and Curator Emeritus in 1985. During his last year in Chicago and the first few in New York, Karl's interests expanded to include African and South American bats. 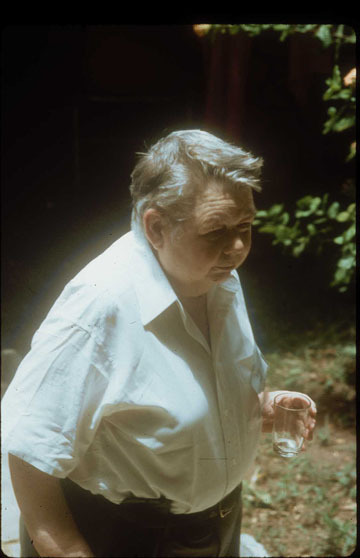 His reanalysis of the taxonomy of Congo bats (1965) began a series of important papers on systematics and zoogeography of African Chiroptera that continued up to nearly the time of his death. Notable among the series are his papers on bats of Sudan (1975, 1986), Liberia (1989), and West Africa (with Mumford and Heisterberg, 1978). As his interests expanded further, he added major systematic and zoogeographic treatments of bats of South America, Australia and the Indo-Malay region, the Pacific Islands, and other regions. Ultimately, Karl became a recognized authority on bat genera and species worldwide, and though he continued to publish regional studies throughout his professional life, he began to be asked to contribute chapters or monographs on all chiropteran species. More recent examples of this sort of paper include the chapter on bats in the 1984 Orders and Families of Recent Mammals of the World (edited by S. Anderson and J. K. Jones, Jr.), a series of papers summarizing the living families of bats in Bat Research News (1982-1985), the chapter on bat families, genera and species in the 1993 Mammal Species of the World (D. E. Wilson and D. M. Reeder, eds. ), and his monumental 1994 "Chiroptera: Systematics" monograph, which appeared in the Handbuch der Zoologie series. Karl traveled extensively in his lifetime to attend scientific meetings, study at museums around the world, and collect specimens. He completely circled the Earth at least twice in his travels. Though he admitted that he was not principally a field biologist, Karl collected bats in Jamaica, the Lesser Antilles, the Bahamas, the Virgin Islands, Mexico, Uruguay, Bolivia, and in Kruger National Park in South Africa. To the delight of comparative morphologists worldwide (myself included), Karl was not exclusively a practitioner of the "skin and skull" school of museum specimen preparation. He generally preserved at least half of each series he collected in alcohol, believing that much valuable information was lost when most of a specimen was discarded. He also developed a unique method of extracting skulls from alcoholic specimens--a technique which amazed anyone who watched him in that it did almost no damage to the rest of the specimen. A number of individuals have attempted to learn his technique, with varying degrees of success. Unfortunately, the fine details of the Koopman skull extraction technique may have been lost with Koopman. Karl attended every annual meeting of the American Society of Mammalogists since his first one in 1954, and presented papers or posters at a number of meetings. He served on the Board of Directors of the Society, and as a member of the Nomenclature, Checklist, and Editorial committees. He was an Associate Editor of Mammalian Species when he died, with principal responsibility for synonymy of genera and species (he will be sorely missed and difficult to replace in that capacity alone). For his meritorious service to the Society, Karl received the Hartley H. T. Jackson Award in June 1988. For his outstanding contributions to the science of mammalogy, Karl was made an Honorary Member of the American Society of Mammalogists in June 1990. Karl was also active in the smaller, more informally organized North American Bat Research Society. Since the second meeting in 1971, he attended every one of the North American Symposia on Bat Research. Ironically, he seemed destined not to attend a bat meeting in Tucson, AZ. He missed the first held in Tucson in 1970 because no one told him about it, and the most recent one, which finally returned after 26 years to Tucson, because of his death. In 1977, at the eighth annual meeting in Ottawa, Canada, the members of the bat society paid Karl their highest honor by presenting the Gerrit S. Miller Jr. Award to him. Karl gave cheerfully and unstintingly of his time and knowledge of mammalogy to all who sought him out, from the most senior of his colleagues to the greenest of graduate students. He willingly served on a number of doctoral committees, including those of Patricia Freeman, Tom Griffiths, Sam McDowell, James Dale Smith, and Fred Szalay. He mentored dozens of pre- and postdoctoral visitors to the American Museum, and shared specimens, data, and his own knowledge with colleagues from around the world. He was a skilled debater. No one who attended the Fifth International Bat Research Conference in Albuquerque will forget the "Great Debate" between Karl and J. D. Smith on the monophyly of the Chiroptera (Karl took the affirmative, of course). The coffee room on the fifth floor of the American Museum was the site of a number of fascinating post-lunch discussion-debates on systematics, in which Karl often participated enthusiastically. His knowledge of geography was profound. He could easily recall in conversation an obscure portion of a river system, desert, or mountain range and discuss it in such detail that it seemed as if an atlas was open in front of him. His sense of humor was droll. He was a passionate (tongue-in-cheek) supporter of global warming, suggesting that a warmer Earth would allow considerable extensions of the ranges of some of his favorite species. When the Queen of England visited the hotel where the bat meetings were held, in Ottawa, Canada in 1977, nearly everyone except Karl was excited to see the Queen close up. When questioned about this, he responded that his ancestors had "fought a war so that--[he]--wouldn't HAVE to be excited about that monarchy!" Very few individuals in modem times have managed to make a specialty of all bats; fewer still have had the profound influence that Karl has had on taxonomy, systematics, and zoogeography of bats. He was a good friend, colleague, and mentor to many people, and he will be greatly missed. 1950 1. Natural selection for reproductive isolation between Drosophila pseudoobscura and Drosophila persimilis. Evolution, 4:135-148. 1951 2. Fossil bats from the Bahamas. Journal of Mammalogy, 32:229. 3. A new fossil rodent from Puerto Rico. American Museum Novitates, 1515:1-9 (with E. E. Williams). 4. Fossil Chiroptera collected by H. E. Anthony in Jamaica, 1919-1920. American Museum Novitates, 1519:1-29 (with E. E. Williams). 1952 5. The status of the bat genus Reithronycteris. Journal of Mammalogy, 33:255-258. 6. West Indian fossil monkeys. American Museum Novitates, 1546:1-16 (with E. E. Williams). 1953 7. A cave faunule from western Puerto Rico with a discussion of the genus Isolobodon. Breviora, 12: 1-8 (with T E. Reynolds and E. E. Williams). 1955 8. A new subspecies of Chilonycteris from the West Indies and a discussion of the mammals of La Gonave. Journal of Mammalogy, 36:109-113. 9. The relationships of the West Indian species of Aratinga (Aves, Psittacidae). American Museum Novitates, 1712:1-20 (with D. Marien). 10. Cave fossil vertebrates from Camaguey, Cuba. Breviora, 46:1-8 (with R. Ruibal). 1956 11. Bats from San Luis Potosi with a new record for Balantiopteryx plicata. Journal of Mammalogy, 37:547-548. 1957 12. Evolution in the genus Myzolema (Aves, Meliphagidae). The Auk, 74:49-72. 13. Notes on the mammals of the Bahamas with special reference to the bats. Journal of Mammalogy, 38:164-174 (with M. K. Hecht and E. Ledecky-Janecek). 1958 14. A fossil vampire bat from Cuba. Breviora, 90:1-4. 15. Does Pygoderma occur in North America? Journal of Mammalogy, 39:584. 16. Land bridges and ecology in bat distribution on islands off the northern coast of South America. Evolution, 12:429-439. 1959 17. The zoogeographical limits of the West Indies. Journal of Mammalogy, 40:236-240. 18. [Review of] Hershkovitz. A geographical classification of Neotropical mammals. Journal of Mammalogy, 40:258-259. 19. [Review of] Hall and Kelson. The mammals of North America. Frontiers, 24:26. 20. Subfossil mammals from the Gomez Farias Region and the tropical gradient of eastern Mexico. Journal of Mammalogy, 40:1-12 (with P. Martin). 1961 21. A collection of bats from Sinaloa with remarks on the limits of the Neotropical region in northwestern Mexico. Journal of Mammalogy, 42:536-538. 1963 22. The identity of bats (genus Myotis) collected in Arizona by Miller, Price, and Condit in 1894. American Museum Novitates, 2140:1-3. 1964 23. [Review of] Hershkovitz. Evolution of Neotropical cricetine rodents (Muridae) with special reference to the phyllotine group. The American Midland Naturalist, 71:255-256. 24. Notes on the occurrence and ecology of Tadarida laticaudata yucatanica in eastern Cuba. American Museum Novitates, 2174:1-6 (with G. Silva Taboada). 1965 25. Status of forms described or recorded by J. A. Allen in "The American Museum Congo Expedition Collection of Bats." American Museum Novitates, 2219:1-34. 26. A northern record of the yellow bat. Journal of Mammalogy, 46:695. 27. [Review of] Rosevear. The bats of West Africa. Science, 150:1803. 1966 28. Taxonomic and distributional notes on southern African bats. The Puku, Occasional Papers of the Department of Game and Fisheries, Zambia, 3: 155-165. 29. Bats in Iceland. American Museum Novitates, 2262:1-6 (with E. Gudmundsson). 1967 30. The southernmost bats. Journal of Mammalogy, 48:487-488. 31. Artiodactyls. Pp. 385-406, in Recent mammals of the world (S. Anderson and J. K. Jones, Jr., eds. ), Ronald Press, New York, 453 pp. 32. Chiroptera. Pp. 68-70, in McGraw-Hill Encyclopedia of Science and Technology, McGraw-Hill, New York, volume pagination unknown. 33. Bats. Pp. 109-150, in Recent mammals of the world (S. Anderson and J. K. Jones, Jr., eds. ), Ronald Press, New York, 453 pp. (with E. L. Cockrum). 34. [Review of] Davis. The giant panda. Quarterly Review of Biology, 42:72-73 (with G. T. MacIntyre). 1968 35. Taxonomic and distributional notes on Lesser Antillean bats. American Museum Novitates, 2333:1-13. 36. [Review of] Heptner. Die Sauegetiere der Sowjetunion, vol. 1: Paarhufer and Unpaarhufer. Quarterly Review of Biology, 43:95-96 (with G. T. MacIntyre). 1970 37. A second locality for Eudiscopus denticulus (Chiroptera, Vespertilionidae). Journal of Mammalogy, 51:191. 38. Zoogeography of bats. Pp. 29-50, in About bats--a chiropteran symposium (B. H. Slaughter and D. W. Walton, eds. ), Southern Methodist University Press, Dallas, Texas, 339 pp. 39. Classification of bats. Pp. 22-28, in About bats--a chiropteran symposium (B. H. Slaughter and D. W. Walton, eds. ), Southern Methodist University Press, Dallas, Texas, 339 pp. (with J. K. Jones, Jr.). 40. [Review of] Kurten Pleistocene mammals of Europe. Quarterly Review of Biology, 45:61-62 (with G. T. MacIntyre). 1971 41. Taxonomic notes on Chalinolobus and Glauconycteris (Chiroptera, Vespertilionidae). American Museum Novitates, 245 1: 1-10. 42. The systematic and historical status of the Florida Eumops (Chiroptera, Molossidae). American Museum Novitates, 2478:1-10. 43. Results of Archbold Expeditions. No. 95. The genus Chalinolobus (Chiroptera, Vespertilionidae). Taxonomic review of Chalinolobus picatus, C. nigrogriseus, and C. rogersi. American Museum Novitates, 2468:1-30 (with H. M. van Deusen). 1972 44. Eudiscopus denticulus. Mammalian Species, 19:1-2. 1973 45. Systematics of Indo-Australian Pipistrellus. Periodicum Biologorum, 75:113-116. 46. [Review of] Keast et al. Evolution, mammals, and southern continents. Quarterly Review of Biology, 48:16-19. 1974 47. Eastern limits of Plecotus in Mexico. Journal of Mammalogy, 55:872-873. 1975 48. Bats of the Sudan. Bulletin of the American Museum of Natural History, 154:353-444. 49. Bats of the Virgin Islands in relation to those of the Greater and Lesser Antilles. American Museum Novitates, 2581:1-7. 1976 50. Zoogeography. Pp. 39-47, in Biology of bats of the New World family Phyllostomatidae, Part I. (R. J. Baker, J. K. Jones, Jr., and D. C. Carter, eds. ), Special Publications, The Museum, Texas Tech University, Lubbock, 10, 218 pp. 51. Catalog of type specimens of Recent mammals in the Academy of Natural Sciences at Philadelphia. Proceedings of the Academy of Natural Sciences, Philadelphia, 128:1-24. 1978 52. Zoogeography of Peruvian bats with special emphasis on the role of the Andes. American Museum Novitates, 2651:1-33. 53. The genus Nycticeius (Vespertilionidae) with special reference to tropical Australia. Pp. 165-171, in Proceedings of the Fourth International Bat Research Conference (R. J. Olembo, J. B. Castelino, and E. A. Mutere, eds. ), Kenya National Literature Bureau, Nairobi, 328 pp. 54. Bat records from Upper Volta, West Africa. American Museum Novitates, 2643:1-6 (with R. E. Mumford and J. E. Heisterberg). 1979 55. Zoogeography of mammals from islands off the northeastern coast of New Guinea. American Museum Novitates, 2690:1-17. 1980 56. Phylogenetic analysis of chiropteran dentition. Pp. 279-288, in Proceedings of the Fifth International Bat Research Conference (D. E. Wilson and A. L. Gardner, eds. ), Texas Tech University Press, Lubbock, 434 pp. (with G. T. MacIntyre). 1981 57. The distributional patterns of New World nectar-feeding bats. Annals of the Missouri Botanical Garden, 68:352-368. 58. [Review of] Stanley. Macroevolution: pattern and process. Bioscience, 31:170. 59. [Review of] Corbet and Hill. A world list of mammalian species. Journal of Mammalogy, 62:860-861. 60. [Review of] DeBlase. The bats of Iran: systematics, distribution, ecology. Journal of Mammalogy, 62:861. 61. Does interspecific competition limit the sizes of ranges of species? American Museum Novitates, 2716:1-10 (with S. Anderson). 62. Notes on bats from the Pacific lowlands of Guatemala. Journal of Mammalogy, 62:406-411 (with R. W. Dickerman and C. Seymour). 63. The status of Lamingtona lophorhina McKean and Calaby, 1968 (Chiroptera: Vespertilionidae). Bulletin of the British Museum (Natural History), Zoology Series, 41:275-278 (with J. E. Hill). 1982 64. A synopsis of the families of bats, part 1. Bat Research News, 23:15-16. 65. A synopsis of the families of bats, part II. Bat Research News, 23:26-27. 66. Results of the Archbold Expeditions. No. 109. Bats from eastern Papua and the East Papuan Islands. American Museum Novitates, 2747:1-34. 67. Biogeography of the bats of South America. Pp. 273-302, in Mammalian biology in South America (M. A. Mares and H. H. Genoways, eds. ), Special Publications, Pymatuning Laboratory of Ecology, University of Pittsburgh, 6:1-539. 68. The Sulawesian Pteropus arquatus and P. argentatus are Acerodon celebensis; the Philippine P. leucotis is an Acerodon. Journal of Mammalogy, 63:319-328 (with G. G. Musser and D. Califia). 69. Bats of Bolivia: an annotated checklist. American Museum Novitates, 2750:1-24 (with S. Anderson and G. K. Creighton). 1983 70. A synopsis of the families of bats, part III. Bat Research News, 24:1-2. 71. A synopsis of the families of bats, part IV. Bat Research News, 24:17-18. 72. A significant range extension for Philetor (Chiroptera, Vespertilionidae) with remarks on geographical variation. Journal of Mammalogy, 64: 525-526. 73. Two general problems involved in systematics and zoogeography of bats. Pp. 412-415, in Advances in herpetology and evolutionary biology. Essays in honor of Ernest E. Williams. (A. G. J. Rhodin and K. Miyata, eds. ), Museum of Comparative Zoology, Cambridge, Massachusetts, 725 pp. 1984 74. A synopsis of the families of bats, part V. Bat Research News, 24:36-38. 75. Taxonomic and distributional notes on tropical Australian bats. American Museum Novitates, 2778:1-48. 76. Bats. Pp. 145-186, in Orders and families of Recent mammals of the world (S. Anderson and J. K. Jones, Jr., eds. ), Wiley-Interscience, New York, 686 pp. 77. A progress report on the systematics of African Scotophilus (Vespertilionidae). Proceedings of the Sixth International Bat Research Conference, pp. 102-113. 1985 78. A synopsis of the families of bats, part VI. Bat Research News, 25:15-17. 79. A synopsis of the families of bats, part VII. Bat Research News, 25:25-27. 80. Notes on bats of Florida's lower keys. Florida Science, 48:37-41 (with J. D. Lazell, Jr.). 1986 81. Sudan bats revisited: an update of "Bats of the Sudan." Cimbebasia (A) 8:10-13. 1988 82. Systematics and distribution. Pp. 7-17, in Natural history of vampire bats (A. M. Greenhall and U. Schmidt, eds. ), Chemical Rubber Company Press, Boca Raton, Florida, 246 pp. 1989 83. Distributional patterns of Indo-Malayan bats (Mammalia: Chiroptera). American Museum Novitates, 2942:1-20. 84. Systematic notes on Liberian bats. American Museum Novitates, 2946:1-12. 85. A review and analysis of the bats of the West Indies. Pp. 635-644, in Biogeography of the West Indies (C. A. Woods, ed. ), Sandhill Crane Press, Gainesville, Florida, 878 pp. 86. [Review of] Kunz. Ecological and behavioral methods for the study of bats. Smithsonian Institution Press, Recent Publications in Natural History, 7:2. 87. A record of the tube-nosed bat (Murina florium) from western New Guinea (Irian Jaya) with notes on related species (Chiroptera, Vespertilionidae). American Museum Novitates, 2934:1-5 (with T. N. Danforth, Jr.). 88. A further note on nomenclature in Lemuridae. Journal of Human Evolution, 18:499-500 (with I. Tattersall). 1991 89. The systematic relationship of Emballonura nigrescens to other species of Emballonura and to Coleura (Chiroptera: Emballonuridae). American Museum Novitates, 2996:1-16 (with T. A. Griffiths and A. Starrett). 1992 90. Taxonomic status of Nycteris vinsoni Dalquest (Chiroptera, Nycteridae). Journal of Mammalogy, 73:649-650. 1993 91. Order Chiroptera. Pp. 137-241, in Mammal species of the world: a taxonomic and geographic reference. Second edition. (D. E. Wilson and D. M. Reeder, eds. ), Smithsonian Institution Press, Washington, DC, 1206 pp. 92. Modern equivalents of genera in Dobson's 1878 "Catalogue of the Chiroptera in the British Museum." Bat Research News, 34:82-86. 1994 93. Chiroptera: Systematics. Handbuch der Zoologie, vol. VIII. Mammalia, part 60, Walter de Gruyter, Berlin, 217 pp. 94. [Review of] Corbet and Hill. The mammals of the Indomalayan region: a systematic review. Journal of Mammalogy, 75:799-803 (with G. G. Musser). 1995 95. Extinction and biogeography of bats on 'Eua, Kingdom of Tonga. American Museum Novitates, 3125:1-13 (with D. W. Steadman). 96. The bats of Liberia: systematics, ecology, and distribution. American Museum Novitates, 3148: 1-24 (with C. P. Kofron and A. Chapman). 1996 97. [Review of] Peterson, Eger, and Mitchell. Faune de Madagascar, vol. 84, Chiropteres. Bat Research News, 37:48. 98. [Review of] Adams (ed.). The evolution of Theodosius Dobzhansky: essays on his life and thought in Russia and America. Bioscience, 46: 217. 1997 99. Chiroptera. Pp. 621-622, in McGraw-Hill Encyclopedia of Science and Technology, 8th Edition, McGraw-Hill, New York, 3, 1-765. 100. Marie A. Lawrence: 1924-1992 [Obituary]. Journal of Mammalogy, 78:256. 101. The subspecies of Emballonura semicaudata (Chiroptera: Emballonuridae). Journal of Mammalogy, 78:358-360. 102. A second species of Carollia from Trinidad. Bat Research News, 38:4-5 (with A. M. Greenhall).